The first dealings I had with a Shih Tzu and the moments following purchase of my first dog, I was introduced to the book, This is the Shih Tzu. By that very name of the book, I felt there was something special about this breed. Boy, was I right!! This dog gives such love and companionship, that it is hard to imagine another breed that would be better for the “empty nest” syndrome or for people wanting a gentle, loving family pet. From breeding these dogs for several years, I have found that it is possible for people to mess up the relationship between themselves and their dog. Here are the things you do to "mess it up" for yourself and your pet. I wanted to call this book, "Can We Get Any Dumber? ", but really felt that title might offend some people who are taken in by the cuteness and adoration of Shih Tzu. So I decided to try to help people in a more subtle way, who fall in love with the Shih Tzu . I have certainly made my share of mistakes and have actually learned from some of them. I always try to help people with the knowledge and expertise I have gathered to make their lives easier, while dealing with the malady I refer to as “TzuVotion”. Chapter 1 “TzuVotion” What It Is? “TzuVotion” is a transformation into a real love for this breed. It won’t happen to everyone. Some people are immune to the love of dogs completely. Others actually prefer dogs with noses (“real dogs” as my vet remarks). It takes hold of you very suddenly. It usually happens to people who love the snub nosed breeds, and when it does, you feel very different about life in general. There are a lot of TzuVoted people around. You could be one of those people too, who love a clean, well-managed, orderly house and never in your life wanted a dog to complicate it. Suddenly, your heart melts, your standards about your house are a little more relaxed, your feelings about freedom to do what you want and when you want are much more prone to needing this little dog to fulfill what might be missing in your life. Usually, it only takes a look at one of these dogs to acquire it. Sometimes, a person will try to "connect" with one at the breeder's home that he or she feels has the right "personality" . Truth is, the Shih Tzu has only one basic personality and that is to win you over with love. When you get one home, you might find this to be a different story. You will learn more about this in the chapter, "Bringing Baby Home." TzuVotion can cause you to do really weird things. It can cause you to spend large amounts of money on things such as expensive dog beds, toys, clothes, treats, and other dog related items too numerous to mention here. You will find these items, I am sure, as vendors seem to be able to connect to these people and their pocketbooks, especially soon after a new puppy purchase. It might be pointless for me to tell you not to buy these items and save your money, as you would be too fresh into the condition of TzuVotion. But I will still try. 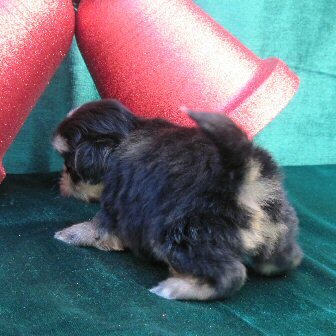 So that special Shih Tzu pup has won your heart and you want to prepare to bring this little baby home. The object here is to spend money wisely and make purchases that will last throughout the life of your dog. Yes, I said, "the life of your dog." Many things you buy at this point are needless (or even harmful). You must think in terms of "the life of your dog" and Shih Tzu can live upwards of 16 years. Shih Tzu are not disposable items, and can be a joy to you for years if you do most right by them. They do not have to be that much trouble and expense to you if you prepare. But prepare, correctly. Some people with TzuVotion have spent a small fortune at the big pet stores and are still not correctly prepared. I will try to help in this regard. Buy a Puppy Play Yard. Walmart will love me for this one. This is a purchase that will set you back around $55 and should be your most expensive item. PetsMart has it for around $90. Petco has the same item for around $130. But you can find it with Walmart online in the Babies & Kids section, where it is sold as a North State Play Yard for children for around $55. If you order it online, you can pick it up at your local Walmart with no shipping cost. Where you buy it is your business, but I like the lower price. It will be big enough for your pup throughout its whole life and will keep it safe and secure, not to mention keep your home from being damaged as the pup goes through its teething stage. This enclosure will contain your dog safely when you are out, when you are busy at home, or at night when you are sleeping. A puppy will know then where his puppy pad is, his food/water is and where his bed is. A puppy needs to know these things. It helps him feel secure. After all, dogs are den animals, and Shih Tzu are dogs, thus Shih Tzu are den animals. Isn't that a brilliant deduction? I said earlier that I would address the subject in this chapter that the personality of a Shih Tzu is to win you over with love. I know of several things that could keep this from happening in the areas of disappointment or heartache. If you let your two year old child have full run of the house, you are basically doing the same if you let a puppy have full roam of the house. Children can find electric cords, and so can puppies. Safety must prevail. Preventing the soiling of carpets should be a no-brainer, but we have what seems to be intelligent people in beautiful homes ask us how to train their pup from peeing on their carpets. One person told us just today that his wife simply does not want to pen or crate the puppy and gives the pup free roam while they are out of the house. This is an advanced case of TzuVotion. We tried to shake them back into reality. We told them of the Puppy Play Yard as I am sure we did earlier. One thing I am sure of, I want the pups we place to be a joy in all their homes. I am so afraid this will not be the case if our early training is not reinforced in the new home. The Puppy Play Yard corrects this problem and I know of nothing better to give you assurance that your pup and your home are safe from pitfalls related to doggie activities. Yet, it still gives your puppy enough room to move around and play. As your pup grows into adulthood, do not discard the Play Yard. It can be moved to different areas such as outside on a nice day. It can enclose the dog away from activities that are not dog related, or provide a place for him to wait till you get home from work. The Puppy Play Yard comes in 6 sections and can be reduced to 4 sections to be located to a smaller area if you need it to be. Regardless, it will give your pet more room than even the largest crate. And it is easily washed with a hose outside. We use Wellness, a holistic food with no fillers in all life stages. we feed canned Wellness to our puppies from about 4 weeks until they have teeth to handle the dry food. I am convinced this food is best, but whatever food you choose, it is probably not going to be sold at grocery stores or discount stores. Feel good about the dog food you are feeding. Our dogs flourish on it, so I know of no reason to change. You just need to feel that you are doing your best by your pet in this department. Give treats (quality only) when the dog does something right. Sows ears, NOT rawhide treats, are great for chewing urges and cleaning teeth. Rawhide can break off and choke the dog, and can also irritate the lining of the stomach to the extent it can cause bloody stool. I take sows ears away when they become small enough for the dog to choke on. I retrieved one from the back of the throat of one of my dogs in the middle of the night when I heard the dog choking. Shih Tzu are toy freaks. They love the “squeakables”, the “softies”, the “teethers” and the interactive toys. They will love their favorite toys, so just keep them clean, and don't break the bank on them either. Toys at Walmart are at the best prices. Just be sure they are safe and recommended for dogs. Ceramic dog bowls at the dollar stores are great for food. Hanging water bottles with Lixit spouts are best for drinking water. The bottle prevents drenching the face with water (as will happen from a water bowl), and the water stays fresh. Dirty water can cause a condition called Giardia and you don't need that (and by the way, humans can also contract it). Neither does your pup. Ceramic or stainless steel or aluminum bowls work best and can be washed in the dishwasher. I don't know how many people I have clued in at Petco or PetsMart about the high cost of beds. Don’t buy them there unless you just like giving away money. Instead, buy online from Petedge the Sherpa fleece beds that you can throw in the washer. They last longer than other brands of fleece beds we have tried. Do not feel that you have to buy the ones with exposed foam rubber or inserted cedar chips. Foam will end up shredded on the floor and cedar chips are supposed to keep fleas away. If you are diligent in administering monthly flea preventatives like you should be, you will not need a dog bed to keep away fleas. Frontline, Revolution, Advantix, Heartgard, or whatever your vet recommends has made all this nonsense, a thing of the past. I use Otomite from the vet’s office for ear mite prevention. Do not waste your money on anything else you happen to notice in the grocery aisle. And shame on you if your dog gets any of these things. This means you are not doing your job as a protector of that special doggie. These products are expensive, but can be cheaper at a feed store or online or from 1-800-PetMeds. Sometimes, vets have good deals on them. And your vet will keep a record of your purchases. The vet will ask for proof of administering heartworm medication if ever your dog needs to undergo any surgery. If you use a vendor other than your vet, he won’t have that proof. He will then in most cases have to do a heartworm test before surgery. A dog will die in surgery if heartworm is present. Be prepared to present proof or pay for the test. It rests my mind to go ahead and do the test, and we are current on monthly medications. You will want to keep your dog clean, so he or she can jump in your lap. So bathe it before he starts to smell like a dirty dog. That could be weekly or twice a week or every two weeks, depending on the lifestyle of your dog. Shih Tzu are prone to getting yeast infection in the ears, especially in humid climates. We keep on hand a medication we get from our vet for treatment of yeast infection, which is distinguished by its odor in the ears. We also use an ear flush to clean the ear canal after we bathe a dog. Use Q-Tips to clean out the ear shortly after applying the flush. People ask me what kind of shampoo to use. Always start with the head and face using a puppy tearless one, no matter what age of dog you are bathing. Then choose the shampoo of choice on the dog’s body as to the fragrance you like. You are the one in contact with your dog so it will be up to you to decide if you want it to smell like baby powder, strawberries or mangos. Use a good moisturizer for the skin and hair and you are set to towel and blow dry. I use hair dryers propped on wire cages to dry the dogs while I do other things. Be sure not to use the hot settings. Watch that electric cord hanging over the cage is not where the dog can chew on it. I use cloth medical pads with my Shih Tzu. They can't destroy them, but of course, they are more trouble as you have to wash them. You will save money on this aspect of training by hundreds of dollars throughout your pet’s life. We buy them online from a supplier in Florida at www.ezwhelp.com If you do want to start out with the paper ones, buy them at Walmart to get the best price. Never buy them at a pet store as the price is way too much. If you need to ever destroy the enzyme of urine from carpet or any cloth, use Nature's Miracle sold mainly at pet stores. There are substitutes, but you get what you pay for in this product. Remember your dog can still smell the urine if ammonia products are used to try to cover up the smell. It is important to destroy the enzyme, then rub some vinegar over the area. Dogs hate vinegar so he will avoid this area. Your puppy needs your protection 24/7. An older dog may not like the friskiness of a pup and may snap at it or attack it, and a cat may claw at it. Let other animals around know you accept this puppy and are going to protect it. You need to be the leader of the pack. Do not depend on a child to do it either or depend on a child to close the gate to a fenced yard if the dog is outside the house. We hear the heartache stories too often about lost or stolen pets. A Shih Tzu will drown in water over its head, so be sure it is supervised by an adult and not a child if there is a swimming pool around. A cover over a pool is necessary and your best situation for a Shih Tzu in the home. Electric cords must be placed so a puppy cannot chew on them. In other words, if you have not puppy-proofed your home, now is the time to do it in the same manner you would for a toddler. At 8:00 or 8:30 PM, your dog should retire to its den after supervised potty time outside and should not need or want any more stimulation from you or children. It is his bedtime, if not yours, and because dogs are creatures of habit, you should be able to set your clock by the time the dog wants to retreat to his or her living quarters such as the play yard. He will get that conditioned to the time. In the play yard, be sure you have a bed at one end, food in middle and puppy pad at the other end. The dog should be self-contained for the night. Your pup may wake up and cry to go out in the morning or you may want it to learn to use its puppy pad. So stay asleep and let him use the pad. He will soon learn this is what you want him to do. And you will not have your sleep disturbed. (Just remember that the dog does not distinguish between work days and weekends, so try to remain consistent each day.) Just be sure food and water bottles are full at night so there will be enough for the morning. If you are an early riser and want to get him used to going out, so much the better. But your Shih Tzu will adapt to whatever you want him to do if done consistently. Don't get anything started that you don’t want continued. I have been asked if people should let their Shih Tzu sleep with them. Some people are happy with this taking place every night. One or two of mine jump up and sleep part of the night with me and I do not mind if it is an older dog and it sleeps at the foot of the bed, but I do not sleep well anyway, so I do not encourage it. I have doggie fleece beds around my bed on the floor on which they can sleep and still be in the room with me. The others sleep in their living quarters on clean fleece beds that I can wash daily. If your puppy has a tendency to want to bite your hand, use your finger sideways in their mouth going in like a horse’s bit and say no in a commanding voice. He will get the message and not like the makeshift horse’s bit. The easiest way to not enjoy a puppy is for that puppy to ruin your home. I do not want that to happen to you, so remember these three things in relation to your interaction with your pup. 1. You hold your pup and play with it in your lap. 2. You supervise the pup outside. 3. You put your pup in a play yard. You will run into problems if you do anything else while it is still a pup. I have heard that a puppy does not even know he is going to urinate until he does, so if the puppy pad is not close by a few feet, he won't make it. As he grows older and the bladder is bigger and can hold more (and if he knows where his pad is) he will remember to use the pad. But I still recommend his being on a floor that can be mopped, enclosed in a play yard with a puppy pad while you are away. Don’t forget to neuter your male as soon as the vet will do it (around 5 months, before he develops the marking habit) so he will not mark his territory. So you have made it through the puppy stage successfully. You will continue to enjoy your dog if you have trained him well to go outside or use a puppy pad and you haven’t needed to replace your carpet. I personally think if you are going to be home, it is best to train him to go outside, but we are retired and are home a lot so we can do this. There are several instances, though, that will make it better for you and your dog if he also knows to go on a pad and can revert to that occasionally. Let’s just imagine that several hours of rain will prevent his going out. I have breeders up North who tell me that rain or snow, their dogs go outside. My Shih Tzu look outside and tell me by their looks that “we are not going out in that rain.” Even if they hear thunder (usually before I do), they stay away from the door leading outside. It is then that I lay down pads in several strategic places. Having all floors that can be mopped helps, but if you have carpet, make sure he is enclosed in the play yard that you bought when he was a puppy. Throw in a puppy pad, a toy, a bed, food and water, and let him stay for the duration of the storm. Be sure you change from the puppy food to adult food at the age of one year. Change to senior food at the age of seven years. Have his teeth cleaned professionally by the age of seven years. When having him professionally groomed, have the groomer brush his teeth. Tooth paste for dogs is a must for daily use. You will enjoy your dog more with fresh breath. Do not try to use your own mint paste as dogs hate the mint flavor. I suggest a choke collar for a squirmy dog and excited dogs can be squirmy. They can easily squirm out of a collar. I had one that got excited by cars and would run after the first car he saw (but only the first car; he wouldn’t run after any others). A choke collar prevented his being killed. I had one that was excited by the sight of a cat. A choke collar prevented her from getting away from me and chasing the cat. You say, choke collars are mean. No, choke collars are safety nets. My dogs look to me for protection, so I try hard not to let them down. I haven’t lost one yet. Do not feed your dog “people” food!! I spent many of my early dog ownership years going to vets for “people” food related problems until I finally learned how really dumb I was. I remember one time it was the fourth of July and I thought my dog would enjoy a hot dog like everyone else. Boy was I wrong! Many dollars later, she was fine. First, it teaches the dog to beg for everything, and he will cease to eat his own food (and you will cease to enjoy your meals at home). Second, it is not good for them in any way. People ask me what their new pup will weigh when it is grown. I can average what the parents weigh and get a “guesstimate”, but I don’t know how much people food they will give the dog or how much exercise the dog will get. The added weight gain in feeding “people” food is bad for the dog. Even if you do not give your dog the list of bad things which (off the top of my head) are grapes, onions and chocolate, there are many things that are just sensitive to his stomach. You won’t know what it is till he up-chucks it on your carpet. Do not blame him at this point! Just give him a teaspoon or two of Pepto Bismol and vow to keep the people food out of his diet! Keep on hand other things such as Endosorb from the vet for loose bowels. If he keep throwing up, take him to the vet. If you spend enough money doing this, you will quit it after a while. I did. You will need these home remedies anyway, but more so, if you keep feeding “people” food. I placed one pup who gets a New York Strip steak done to her taste when her owner grills her own. Oh well, maybe that owner will read this. But knowing her, it won’t make much difference. Her pup also sleeps with her, shops with her, and goes to work with her. What a lucky dog! She has her own buckle-down car seat that she hops into when her mommy puts her inside the car. What a cute sight! Her case of TzuVotion is terminal. Some dogs are just too cute. This is the Shih Tzu.